It rained all day long this past Friday April 5, 2013 … but cleared long enough for Melissa and Jesse’s beach wedding at the Hilton on Longboat Key. Melissa was escorted across the sand by her father to join Jesse under their wedding arch with the beautiful Gulf of Mexico as their backdrop where, as their family, friends and beach-goers looked on, the couple shared their vows, exchanged rings, and were pronounced husband and wife by Rev. 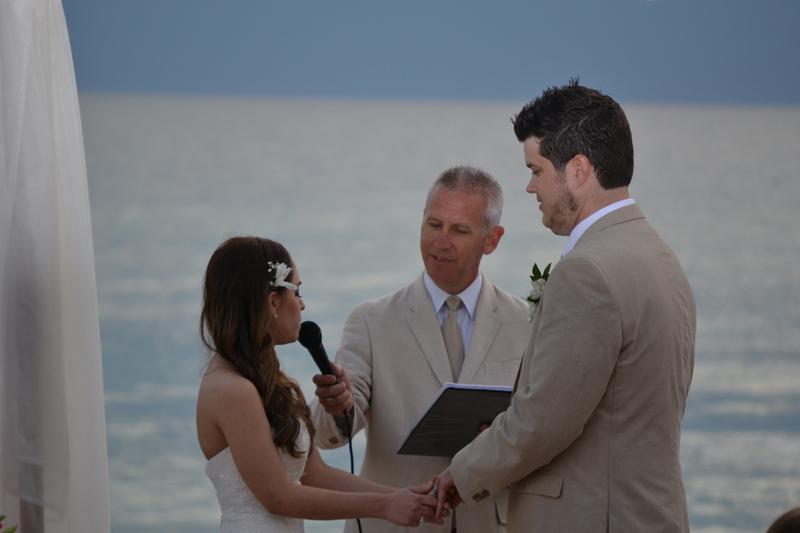 Rick Lackore of Sensational Ceremonies. Rachel Gilmore and her staff at the Hilton handled the venue coordination for the happy couple and their guests. The picture was provided by Tammy Lackore. Congratulations to the new Mr. and Mrs. Jesse Neagles!